With all the new smart locks that have been released over the past year, we’ve been getting an unusually high number of emails asking for recommendations. This is especially true from three particular groups of people: SmartThings users, Amazon Alexa users, and iPhone users looking for a good lock to work with HomeKit. 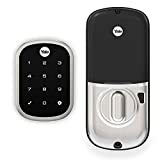 Well, we after weeks of digging and testing, we finally have a definitive answer for all three groups of people, and it’s the same answer whether you want SmartThings integration, Alexa, or HomeKit integration — the Yale Assure SL Key-Free Touchscreen Deadbolt. Beyond the gorgeous look and Yale craftsmanship, the Assure SL features a design that’s so smart. The lock itself is the same regardless of which system you use it with; there’s a swappable module inside that adds in the connectivity. 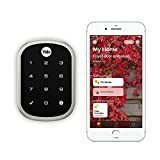 You can buy the lock with either a Z-Wave module for SmartThings or Alexa (or any other Z-Wave compatible smart home system), or an iM1 module for HomeKit, and if you ever switch systems you can just order a new module instead of needing to buy a whole new lock. As for functionality, it’s the most reliable lock we’ve tested in recent history. Automations worked flawlessly with SmartThings, Alexa, and Siri, and unlocking the lock “manually” is a breeze as well. Simply touch the lock with your palm or fist to activate the illuminated touchscreen, key in any of the up to 250 configurable PIN codes, and you’re done. Then to lock the Yale Assure SL on your way out, just touch the screen with your palm or fist. If you’re in the market for a new smart lock or if you’re looking for the perfect last-minute gift, the Yale Assure SL is as good as it gets. Manage Access – Create and share up to 25 (250 when paired to Z-Wave controller or alarm panel) unique pin codes to share with friends and family. Delete when you need to. Key Free – No cylinder means no lost keys and no pick and bump break-ins. Backlit Keypad – Keypad wakes with a touch and has numbers that won’t wear off. Battery Back-up – Never lose power. The lock can be energized with a 9V battery.